The peeps over at Gotein sent me out a box of freebies, portable sticks of protein powder that you can stick in your purse or your gym bag and mix with a bottle of water for an instant shake. The portability is a HUGE selling point, but if you're anything like me and you can park a Prius in your purse, this one is kinda lost on you. 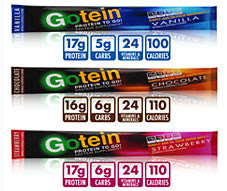 I will tell you that the idea of protein shake in a stick sounded about as appetizing as dehydrated turkey comb and rooster foot stew in a pouch. Full of protein? Yes. Full of deliciousness? Not really so sure about that. But Gotein sent them to me, so I was absolutely going to try them. 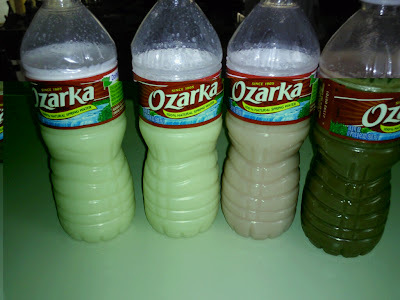 I wanted to use refrigerated water, so I took bottles of Ozarka that had been sitting in my fridge overnight and made the shakes with them. I poured out a little bit of the water and tried to put all of the Gotein in, but it wouldn't fit. I got a spoon to try to help the process, but I just made a powdery wet mess all over the counter. As far as the shake itself, it took WAY to long to shake up and there were floaters all through it. It was pretty much the same for all three bottles. Then...I ACTUALLY READ THE DAMN DIRECTIONS!!! Vanilla had a do over! Oops, sorry. User error y'all. I hadn't actually poured out enough water. Once I poured out the correct amount, what was watery and uninspired turned into protein shake OMG!THISISREALLYGOOD-ness. All of the shakes run a little on the less-sweet side of the spectrum. The strawberry has REAL strawberries*, the chocolate kinda tasted like Quick to me, while the vanilla was a little blah to me. However, once I hit the vanilla with a packet of Truvia, that was the catalyst that it needed to take it over the edge. I seriously liked all three of them. even my friend who doesn't drink protein shakes ever had to agree that the vanilla+truvia was the shiznit. I think they've officially made me a fanboy. Did I mention that they taste great? A teeny bit pricey, but right now they have a 20% off coupon code-MED05 Click the link on the upper right to check them out. I don't have more of the stuff. Well, I actually DO have more of the stuff, but is for one of you! To enter for your chance to win your very own trio of Gotein protein powders that have been sitting on MY very own KITCHEN TABLE!!!!! and very likely sniffed by my pet, here's what you gotta do. Follow this blog via email subscription or Google friend connect. Follow me on twitter for another. Like Gotein on fb and tell them I sent you! That's a total of 6 entries! Make sure that in your comment, you tell me how many of the above you've done so you can be properly credited. If you have privacy concerns, just shoot me an email ( my name at gmail) and we can work something out. *the strawberries were likely sourced from an intergalactic strawberry cloning station cause that shake is OUT OF THIS WORLD. Can't wait to try the goodness. I've done two this n fbook. I liked Gotein on FB and told them you sent me. am i a good girl or what? Me, me, pick me! I done did all those things, I did! I ordered it one day and got it the next. I got strawberry, chocolate, vanilla. Good, ready to try the other 3. Its best when the water is very cold. I took it with me in a cooler. Easy and filling. 6. I will mention your contest in my new blog post as soon as I get it written today & I have your BUTTON on my BLOG!!! I've liked you and Gotein on FB and a follower on Twitter. I'm only a month away from my VSG surgery and soaking up all the info and preparedness I can so I was glad to stumble on your blog. Thanks for that! Been trying out a lot of shakes for my pre and post-surgery weeks, plus just a good way to get a meal on the go I find (helps keep me out of the drive-thru). Ola, Waning Woman - You are a hoot! I WANT to try these. Don't use twitter or facebook...just commenting here to be entered. sbpetal353@aol.com is my email address. Count me in for both twitter and a comment on the blog! Ooooh, here is YOUR review. LOL @the powdered mess and OMG, I really had to choke the strawberry down...go figure, right?